The global market for humic acid, which is rated highly among the most chemically active compound and contains essential phytochemical groups that are highly useful for various applications in agriculture and dietary supplements, is driven by a number of factors, and is projected for a strong CAGR 12.1% during the forecast period of 2016 to 2024, according to the report by Transparency Market Research (TMR). Some of the key factors augmenting the demand in the global humic acid market are growing demand for organic foods and rising concerns regarding the use of chemical fertilizers that cause substantial damage to the arable land, to the environment, and health of living things. On the other hand, inconsistency in quality of commercially available humic acid is somewhat hindering the prosperity of this market. As per the evaluations of the TMR report, the global market for humic acid was worth merely US$387.1 mn in 2015, but the valuation will breach the billion market soon in the near future, estimated to be US$1.04 bn by the end of 2024. The vendors of this market will continue to gain from high growth potential of humic acid in the emerging economies, especially in Asia Pacific, which resides nearly the half of the world’s population. Application-wise, the global humic acid market has been segmented into ecological bioremediation, agriculture, horticulture, dietary supplements, and drilling fluids. Among these, the agriculture sector accounted for more than half of the demand for humic acid in 2015, and is expected to remain the most lucrative application segment throughout the forecast period. Growing trend of organic farming for their apparent health benefits, growing awareness regarding the benefits of humic acid in developing countries, and government initiatives and subsidies to promote the use of ecologically favorable products are some of the factors augmenting the demand in the global humic acid market. On the other hand, the horticulture and dietary supplement segments are also anticipated to increment the demand at a significant rate during the forecast period. The healthy-living trend among the urban population is helping the dietary supplement segment, as the mineral-rich organic foods produced with the help of humic acid add to the human immune system and detoxifies it. Geographically, the report takes stock of the potential of the humic acid market in the regions of North America including the U.S., Europe including the U.K, France, Spain, and Germany, Asia Pacific, Latin America, and The Middle East and Africa (MEA). In 2015, North America was the most profitable region, serving nearly 40% of the global demand for humic acid, and is expected to remain the most lucrative region throughout the forecast period. Easy availability of raw materials, high percentage of disposable income among the citizens, growing awareness regarding the benefits of organic foods, and technological advancements in the production of humic acid are some of the key factors reflecting positively on North America humic acid market. While Europe remains the second most profitable region, vendors of this market are also venturing into the emerging economies in Asia Pacific such as India, China, Japan, and South Korea to expand their horizons. The global humic acid market is highly fragmented, owing to the presence of a large number of local and regional vendors. Some of the leading companies with considerable brand name in this market are Biolchim S.p.A., Humic Growth Solutions, Omnia Holdings Limited, Humintech GmbH, Jiloca Industrial, S.A., Saint Humic Acid, Arihant Bio Fertichem Pvt. Ltd., Sikko Industries Ltd., Minerals Technology Inc., Horizon AG-Products, and Black Earth Humic LP. Various types of humic substances such as humic acid, humus, humate, fulvic acid, organic matter, and humin play an important role in plant nutrition and soil fertility. Humic substances provide an economical and concentrated form of organic matter that can possibly act as a replacement for humus depletion, which is caused as a result of the conventional fertilization methods. Growth in agriculture and horticulture applications and increasing demand for organic food has propelled the usage of humic acid. Rising demand for humic acid in agriculture and horticulture applications is likely to drive the humic acid market in the next few years. However, inconsistency in quality of commercially available humic acid is expected to hamper market growth. High growth potential in emerging economies is anticipated to act as a major opportunity for the humic acid market in the near future. This report analyzes and forecasts the market for humic acid at the global and regional level. The market has been forecast based on volume (kilo tons) and revenue (US$ Mn) from 2016 to 2024, considering 2015 as the base year. The study includes drivers and restraints of the global humic acid market. It also covers the impact of these on the demand for humic acid during the forecast period. The report also highlights opportunities in the humic acid market at the global level. The report includes detailed value chain analysis, which provides a comprehensive view of the global humic acid market. Porter’s Five Forces model for the humic acid market has also been included to help understand the competitive landscape in the market. The study encompasses market attractiveness analysis, wherein applications are benchmarked based on their market size, growth rate, and general attractiveness. 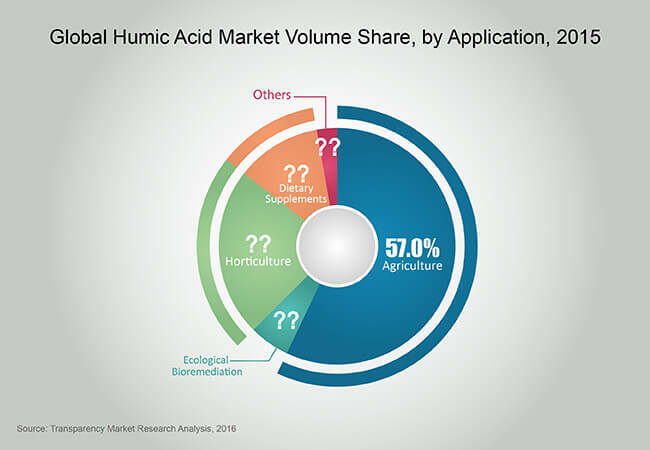 The study provides a decisive view of the global humic acid market by segmenting it in terms of applications such as agriculture, horticulture, dietary supplements, ecological bioremediation, and others (drilling fluids, etc.). These segments have been analyzed based on the present and future trends. Regional segmentation includes current and forecast demand for humic acid in North America, Europe, Asia Pacific, Latin America, and Middle East & Africa. The report also covers the demand for individual applications in all the regions and key countries in each region. The report provides the estimated market size of humic acid for 2015 and forecast for the next eight years. The global market size of humic acid is provided in terms of volume and revenue. Market volume has been defined in kilo tons, while market revenue is in US$ Mn. Market numbers are estimated based on key applications of humic acid. Market size and forecast for applications have been provided in terms of global, regional, and country level markets. In order to compile the research report, we conducted in-depth interviews and discussions with a number of key industry participants and opinion leaders. Primary research represents the bulk of research efforts, supplemented by extensive secondary research. We reviewed key players’ product literature, annual reports, press releases, and relevant documents for competitive analysis and market understanding. Secondary research includes a search of recent trade, technical writing, Internet sources, and statistical data from government websites, trade associations, and agencies. This has proven to be the most reliable, effective, and successful approach for obtaining precise market data, capturing industry participants’ insights, and recognizing business opportunities. Secondary research sources that are typically referred to include, but are not limited to company websites, annual reports, financial reports, broker reports, investor presentations, SEC filings, International Humic Substances Society, Association for Sustainable Development (ASOR), internal and external proprietary databases, and relevant patent and regulatory databases such as ICIS, Hoover’s, oneSOURCE, Factiva, and Bloomberg, national government documents, statistical databases, trade journals, market reports, news articles, press releases, and webcasts specific to companies operating in the market. We conduct primary interviews on an ongoing basis with industry participants and commentators to validate the data and analysis. These help validate and strengthen secondary research findings. These also help develop the analysis team’s expertise and market understanding. The report comprises profiles of major companies operating in the global humic acid market. Key players profiled in the report include Biolchim S.p.A., HCM Agro Products Private Ltd., Humintech GmbH, Humic Growth Solutions, Jiloca Industrial, S.A., Omnia Holdings Limited, Saint Humic Acid, Sikko Industries Ltd., Arihant Bio Fertichem Pvt. Ltd., Shandong Chuangxin Humic Acid Technology Co. Ltd., Black Earth Humic LP, Minerals Technology Inc., and Horizon AG-Products. Market players have been profiled in terms of attributes such as company overview, financial overview, business strategies, and recent developments.